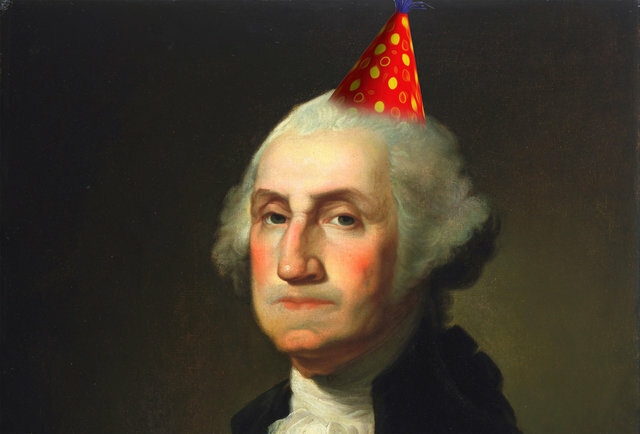 It’s Your Day, George Washington! If you’re planning to celebrate Presidents’ Day tomorrow, hold your horses. There’s really no such thing. Not officially, anyway. According to the federal government calendar, the third Monday in February is Washington’s Birthday, pure and simple. Way back in 1885, in commemoration of the birthday of the Father of Our Country, February 22 became an official federal holiday. For decades, it was observed with patriotic fervor second only to the Fourth of July. Parades, speeches, waving Old Glory and all that other good stuff. Along the way, somebody noticed that another of our great Presidents—Abraham Lincoln—was also born in February. Several states had been observing February 12 as a holiday for years. Maybe the federal government should recognize the birthday of the Great Emancipator, too. These days, only four states—Illinois, Connecticut, Missouri and New York—designate February 12 as an official state holiday, though several places observe it in other ways. Kentucky, for example, where a wreath-laying ceremony takes place near the site of Lincoln’s birth in Hodgenville. So how did the third Monday in February—which, by the way, never falls on the 22nd–come to be known as Presidents’ Day? Or President’s Day or simply Presidents Day, depending on who’s writing it? No one knows for sure. Because both Washington and Lincoln were born in February, the popular assumption is that the holiday was designed to honor both men. But hold on. Twther Presidents—the ill-fated William Henry Harrison, who died of pneumonia only 32 days after taking office, and movie-star-turned-politician Ronald Reagan—were also born in February. Shouldn’t Presidents’ Day honor them, too? Who wouldn’t be in favor of such a thing? And who more so than retailers, who are always eager to jump on the bandwagon of any celebration that creates yet another reason to shop. It works for Jesus’ birthday, why not Washington’s birthday, too? Government workers, bankers and schoolchildren agree. Call Washington’s Birthday by any name you want, they say, as long as they can sleep late on Monday. I may try to catch a few extra zzzzz’s myself tomorrow. Then I’ll probably hit the stores. I’ve been needing some new sheets and towels for quite a while.